A nerve cell is a neuron. Neurons are specialize for conduction. They send signals via a nervous impulse. Neurons have a high metabolic rate. They are unable to survive long without oxygen. They have an extremely long longevity, lasting a lifetime. Neurons do not divide. The cell body of a neuron is called a perikaryon or soma. The basophilic clusters of ribosomes and rough endoplasmic seen in neuron cell bodies is called Nissl, Nissl bodies or Nissl substance. The terminal bouton is the end portion of an axon. It is also called an axon terminal or end bulb. The terminal bouton will be associated with another neuron in a synapse. The central nervous system consists of the brain and spinal cord. All other nervous system elements are considered to be in the peripheral nervous system. An astrocyte is a supporting cell seen in the central nervous system. Basket cells are a type of neuron seen in the cerebellum. Neuroglia are the supporting cells in the central nervous system. Sometimes, neuroglia are called glial cells or glia. Schwann cells are responsible for the myelination of neurons in the peripheral nervous system. A ganglion is a collection of nerve cell bodies outside of the CNS. Satellite cells are found in the ganglia of the peripheral nervous system. 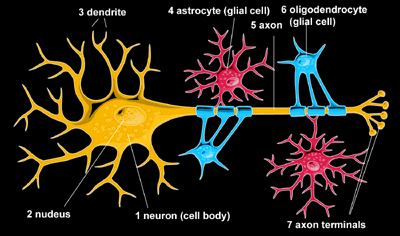 Neurons can be classified based on the number of axons and dendrites stemming off of the cell body. A unipolar neuron has one process which branches off of it This process then immediately divides into two. Thus, a unipolar neuron is sometimes also called a pseudounipolar neuron. Sensory neurons are unipolar. A bipolar neuron has two process that branch from it: an axon and a dendrite. Bipolar neurons are not very common and are found in some of the organs for special senses. Bipolar neurons are found in the retina, inner ear, and the region of the nose involved with smell. An olfactory cell is a bipolar neuron. 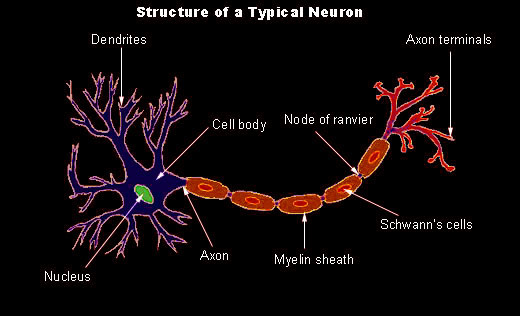 Multipolar neurons have one axon and many (at least two) dendrites that branch off of it. Motor neurons and interneurons are multipolar Most neurons in the body (over 99%) are multipolar. Both motor neurons and interneurons are multipolar. Interneurons are the neurons between the sensory and motor neurons. 99.9% of all neurons are interneurons. The vast majority of neurons are interneurons. Interneurons are also called internuncial neurons. Neuroglia are the supporting cells of the central nervous system. Sometimes, neuroglia called glial cells or glia. Astrocytes, ependymal cells, oligodendrocytes, and microglia are all neuroglia. Of the neuroglia cells, astrocytes are the most abundant and the largest. These are star shaped cells involved in the blood brain barrier. Ependymal cells line the ventricles and spinal canal. Oligodendrocytes form myelin in the central nervous system.Microglia are the central nervous system macrophages. The meninges are composed of the three connective tissue covers which surround the brain and spinal cord. There are three: dura mater, arachnoid, and pia mater.The dura mater is the outer meninx. The dura mater is composed of dense irregular connective tissue. The arachnoid is made of a delicate spider web like connective tissue.The pia mater is the innermost meninx. It covers the brain intimately. The outer part of the cerebrum and cerebellum is gray matter. It is called the cortex. Underneath the cortex, is white matter. Gray matter is also found in conglomerations within the cerebrum and cerebellum where it is called nuclei. Gray matter is found in the central portion of the spinal cord in a butterfly shape. White matter is on the outer portion of the spinal cord. The outer part of the brain is gray matter called the cortex. The conglomerations of gray matter deep within the cerebrum and cerebellum are called nuclei. Histology hint from Sarah Bellham: Notice that the distribution of gray matter and white matter for the brain and spinal cord is the reverse of each other. On the cerebrum and cerebellum, gray matter is on the outer portion, white matter is deeper. For the spinal cord, white matter is on the outer portion, and gray matter is deeper. The cerebrospinal fluid is found in the subarachnoid space. The subarachnoid space is the space between the arachnoid and the pia mater. Histology hint from Sarah Bellham: Arachnoid is derived from the Greek word for spider. It is used in the words arachnophobia, arachnids and arachnoid. The primary component of myelin is lipid. It is formed by the cell wrapping itself around the axon. Thus, it is primarily the plasma membrane of either the Schwann cells (in the PNS) or the oligodendrocytes (in the CNS). Schwann cells are seen in the peripheral nervous system and are not considered neuroglia. Schwann cells are responsible for the myelination of neurons in the peripheral nervous system. Nodes of Ranvier are the gaps that occur in the myelin sheath. The endoneurium surrounds a nerve fiber. The perineurium surrounds a bundle of nerve fibers. The epineurium surrounds a nerve.